Home / Market Insight, Financial Articles / Weird Street / New Oreo Flavors 2018: Hot Chicken Wing and Wasabi?! The new Oreo flavors 2018 may not be for everyone due to the strange nature of them. The new Oreo flavors 2018 that customers can look forward to, or not, are Hot Chicken Wing and Wasabi. That’s two new flavors and both of them attempt to combine spicy with the chocolate sweetness of an Oreo cookie. Anyone with an interest in trying the new Oreo flavors 2018 are going to have to work hard to do so. These new flavors are only available in China. That might be a good thing as the rest of the world probably isn’t ready for Hot Chicken Wing and Wasabi Oreo flavors. The news of the new Oreo flavors 2018 was announced by Oreo parent company Mondelez International (NASDAQ:MDLZ) via Twitter (NYSE:TWTR). As such, it only seems appropriate to get some reactions from Twitter users about the new Oreo flavors 2018 news. 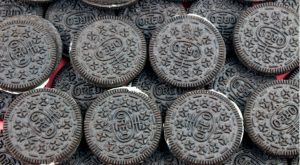 Article printed from InvestorPlace Media, https://investorplace.com/2018/08/new-oreo-flavors-2018-are-weird/.